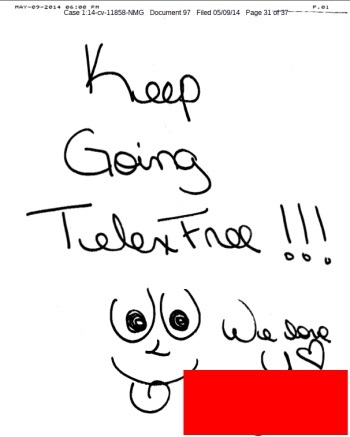 Some TelexFree members sent doodles to the federal judge presiding over the SEC’s fraud case. Redaction by PP Blog. The docket of U.S. District Judge Nathaniel M. Gorton of the District of Massachusetts now shows that members have written letters to the court in support of TelexFree. Gorton is presiding over the SEC’s civil case against TelexFree. The complaint was brought on an emergency basis on April 15. Assets of TelexFree and alleged managers and certain promoters have been frozen. Some of the letters appear to be in Spanish, sent to the judge via fax. Some are handwritten. Some are typewritten. A few of them include doodles. There are letters from the United States. There are letters from the Dominican Republic. Some of the letters appear to have used a shared template, which likely means TelexFree upline/downline groups organized the campaign. In the 2008 AdSurfDaily case, shared litigation templates were used by certain members who appeared to be more interested in advancing conspiracy theories than understanding the facts of the case. Some of the letters/emails of “support” submitted by ASD in 2008 were used by the government to undermine ASD’s assertion it was not selling securities and was not a Ponzi scheme. At least one TelexFree member asserted in a letter to Gorton that the “program” gave him an opportunity to earn money from TelexFree by posting ads on the Internet. On Friday, it became known that the U.S. Department of Homeland Security was involved in an undercover probe of TelexFree that began at least by October 2013. In a criminal complaint and affidavit filed in support of wire-fraud conspiracy charges against TelexFree figures James Merrill and Carlos Wanzeler, a DHS agent involved in the probe alleged an intelligence research specialist within DHS placed more than 700 ads for TelexFree online. “The ads have resulted in no retail sales of TelexFree’s VOIP product,” the agent alleged. Zeek Rewards, an $850 million Ponzi- and pyramid scheme shut down by the SEC in 2012, also had an “advertising” component. So did ASD, a $119 million Ponzi scheme shut down by the U.S. Secret Service in 2008. MLM HYIP schemes have defrauded billions of dollars from participants in recent years. The combined hauls of TelexFree, Zeek and ASD alone may exceed $2.169 billion. That’s nearly double the size of the epic Scott Rothstein Ponzi and racketeering scheme in Florida in 2009. MLM HYIP swindles typically are aimed at vulnerable populations, with MLMers who have big email lists and experience in one fraud scheme after another scoring tremendous windfalls. Our thanks to the ASD Updates Blog. I’m having a bit of trouble reading one of the letters. It seems to say that without TelexFree, a promoter would have been unable to bury his/her mother in December 2013. Os estelionatários são especialistas em copy and paste, de anúncios, cartas e outros textos…. muitos sofrem da síndrome de estocolmo, pois, em sua grande maioria são evangélicos da congregação crista, onde não admite ílicito, sendo assim, preferem não acreditar na verdade que prática pirâmide financeira, e sim marketing multi nível… infelizmente a verdade é uma só, estelionatário disfarçado de trabalhador…. ronaldo: Os estelionatários são especialistas em copy and paste, de anúncios, cartas e outros textos…. muitos sofrem da síndrome de estocolmo, pois, em sua grande maioria são evangélicos da congregação crista, onde não admite ílicito, sendo assim, preferem não acreditar na verdade que prática pirâmide financeira, e sim marketing multi nível… infelizmente a verdade é uma só, estelionatário disfarçado de trabalhador…. To all the ones that say that they don’t have a job and want TF back to feed their kids. You are taking food from other families to feed yours. If it’s good for your financial life, it is with someone else’s money who is getting into a difficult financial sitation. Are you paying and declaring taxes on that money you are taking “earning”? The only $ that is your is what you paid to get into this scam. Other than that is not. There was an HYIP called Tesco in roughly 2006, according to posts on the Ponzi boards.